For more than ten years, the RCM Community Trust has paid for students at our two partner schools, Brown Street Academy and Oliver Wendell Holmes, to participate in the Urban Ecology Center’s Neighborhood Environmental Education Project (NEEP). The philosophy of NEEP is based on research which shows that constant contact with nature early in life, and exposure to adult mentors who demonstrate positive environmental behavior, leads to environmental awareness in children. In the city people often live in apartment buildings and school grounds are often covered in cement. 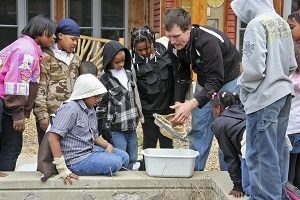 The Urban Ecology Center offers unique urban sanctuaries and “outdoor laboratories” for neighborhood school children. The Center’s staff and volunteers serve as adult mentors to guide students, year after year, as they progress through school. Rather than just another field trip, students have access to an outdoor classroom where science concepts taught in class are reinforced with hands-on outdoor activities during multiple visits. NEEP science-based programs range from basic wildlife and ecology studies, to the physics of sound and light, to simple machines, to energy, to recycling. At a time when physical education programs are being cut, the Center also offers valuable kinesthetic learning opportunities including rock climbing, canoeing, hiking, snow shoeing and ice skating. With the support of the RCM Community Trust, students at Brown Street Academy and Oliver Wendell Holmes have the opportunity to develop strong, lifelong connections to nature through NEEP – now enhanced by the diverse habitats of the Milwaukee Rotary Centennial Arboretum.